right this very minute. We need a little Sidewalk Sale...ing too! The Lyon's Head Antique Mall, where I have two spaces, holds a monthly sidewalk sale from October through March (our winter season where the humidity is low and the temps heavenly). Although I have yet to participate as a seller, I have found some marvelous pieces each time I went to take photos for their website and facebook page. 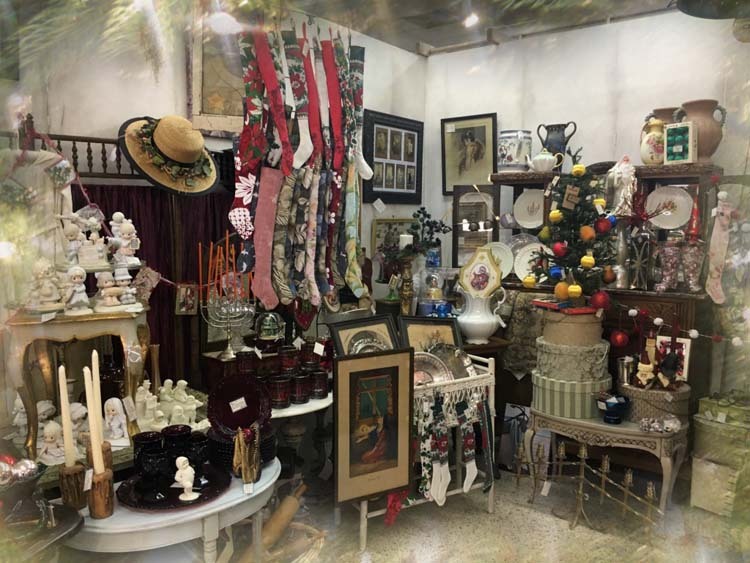 I've been loading up my spaces each weekend with antique and vintage Christmas pieces as well as popular items for gift giving. 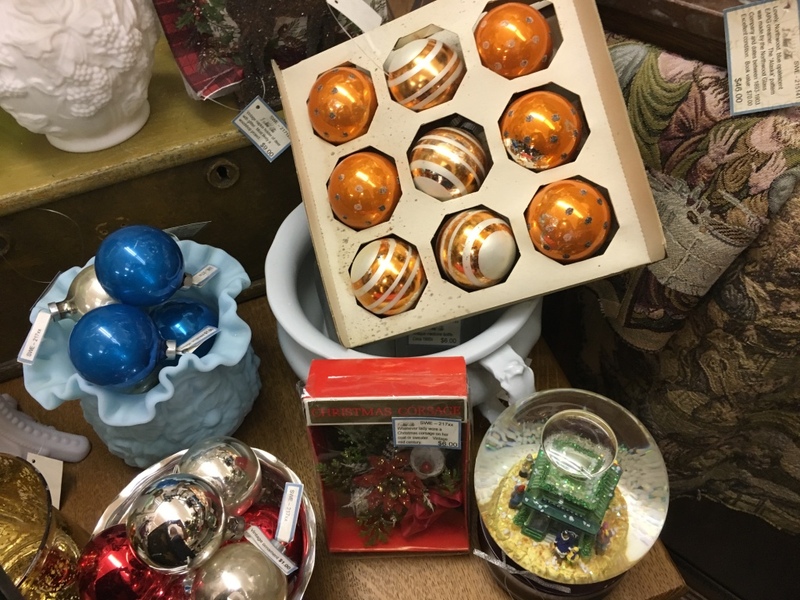 Antique Christmas framed prints, St. Nicks, vintage ornaments, snow babies, and stockings are of what's moving out of my spaces. These vintage glass ornaments did not last 2 days in my space. The unique orange color was pure 1960s. 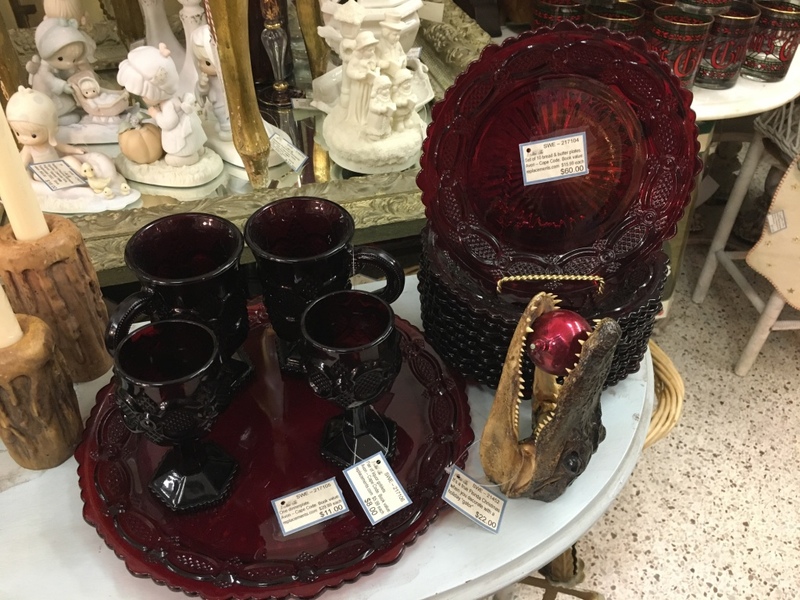 Avon's Cape Code series is still in demand by collectors for the holiday tables. Everyone loves the vintage Lefton sleigh and holly server. 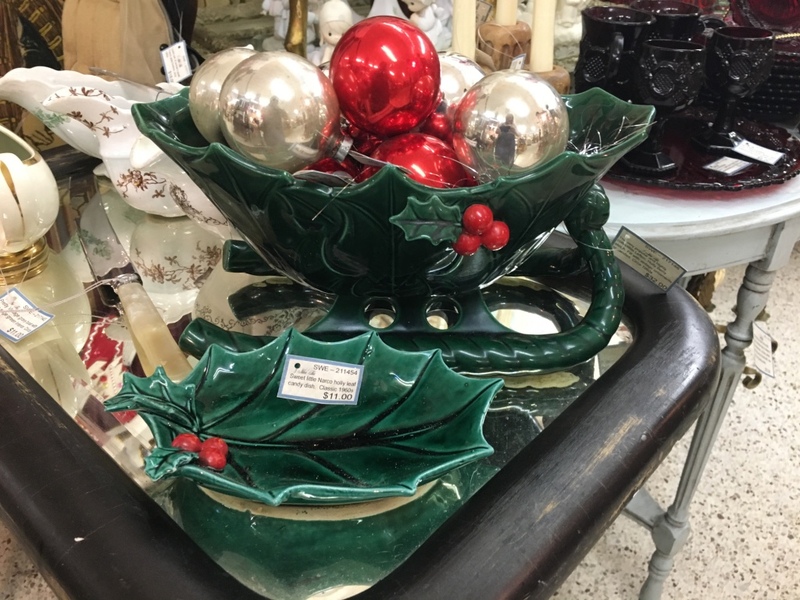 Brilliant Christmas green with red berries, these continue to be sought after holiday items. Original label still on sleigh. Pears for the partridge and an I Believe star for the children. 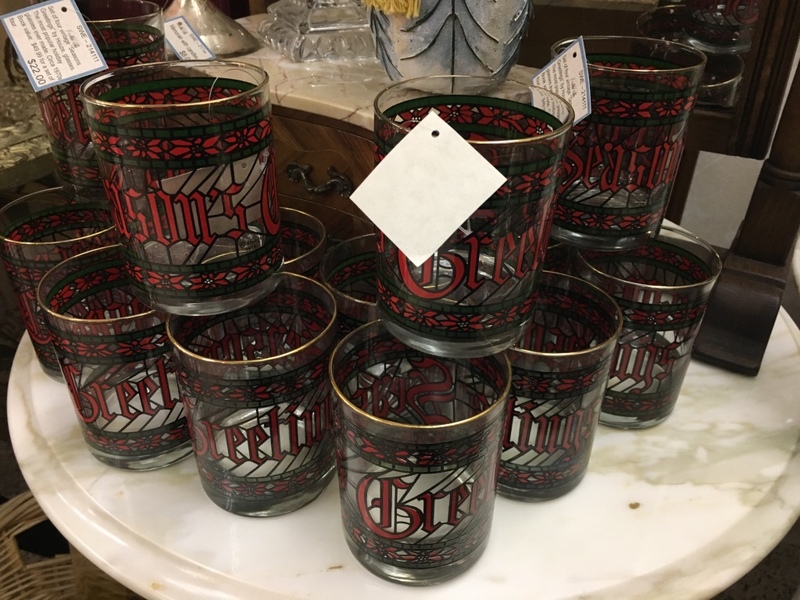 The famous Houzz, "Season's Greetings" stained glass drinking glasses. 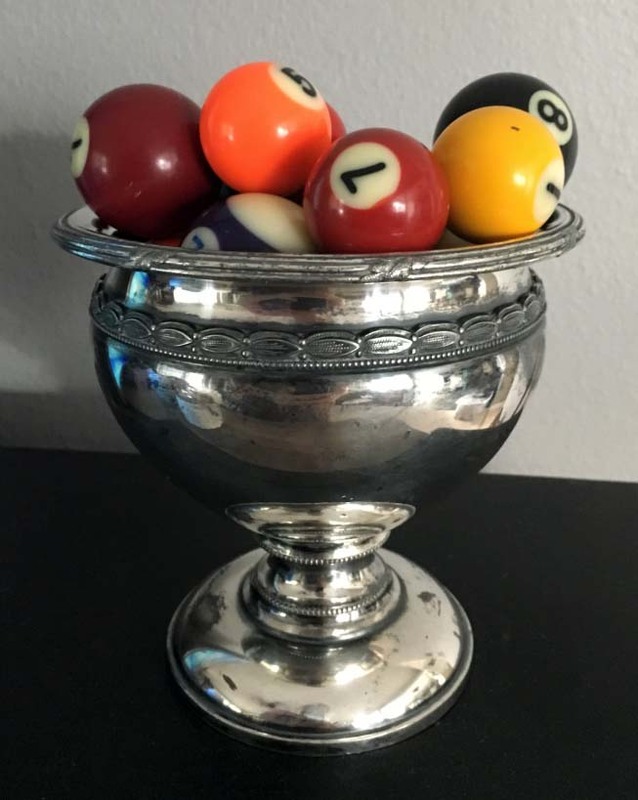 These were first offered in the early 1970s and continue to be a hot seller. Believe it or not, I am still unpacking boxes. My day job has been a bear this year and I have never put in more hours in a day like a do these days. 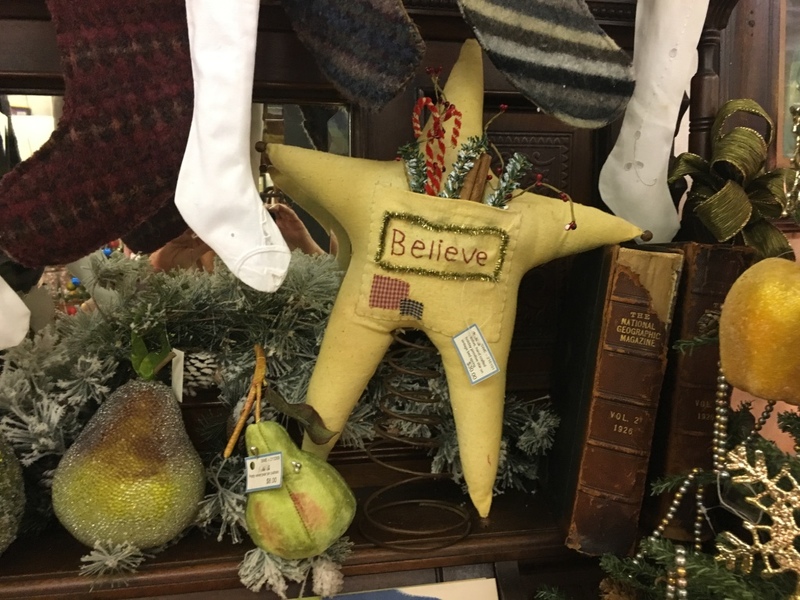 I have been remiss in finishing up my home and pulling out so many of the Christmas inventory only reinforces my desire to get my home in order. I took a vehicle load of items I thought I would use when I moved here to Goodwill, and of course, stopped in for a quick look to see if I could find anything. 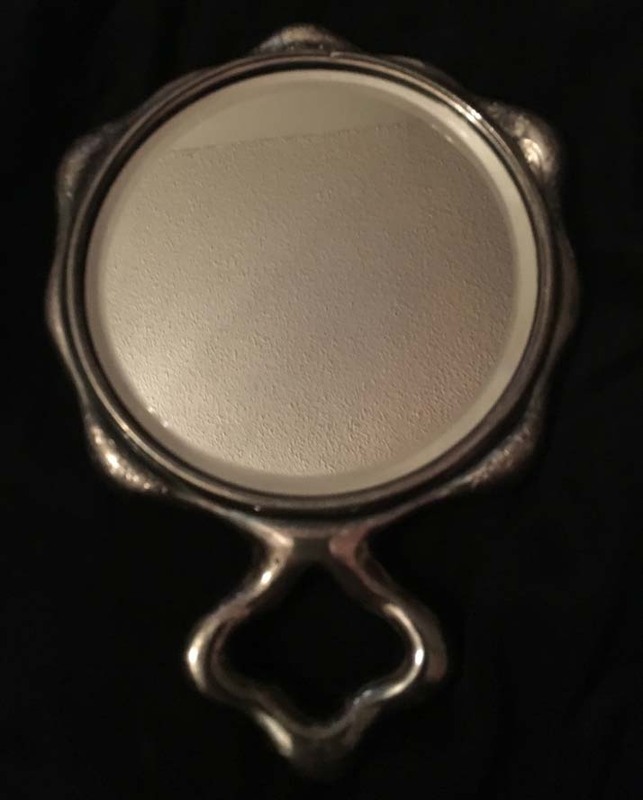 Imagine my surprise when I saw this lovely, Victorian silverplated hand mirror. Yea, it came home with me. 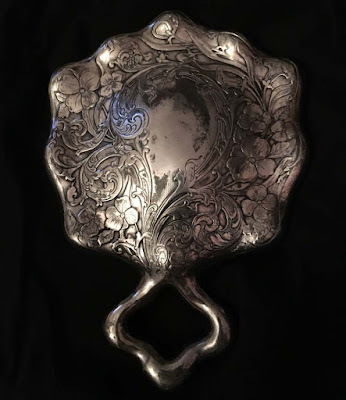 Surprisingly, the mirror itself was in amazing condition as these tend to lose their silvering from water or perfumes over the decades of use. 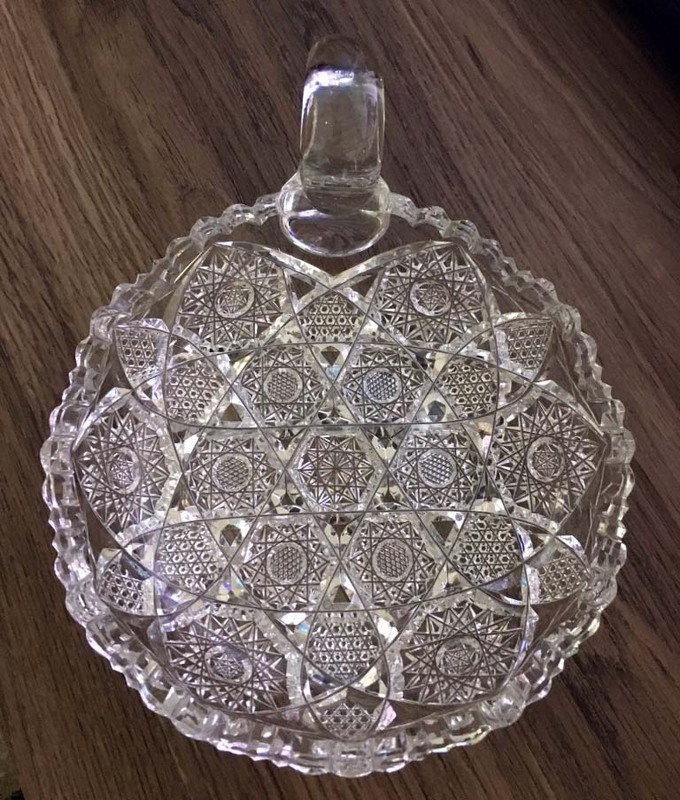 Stunning vintage cut glass piece. Not AMCG, but still lovely. I don't know about you, but I never have enough serving spoons come the holidays so I nearly squealed with delight when I came across this set of six large tablespoons. 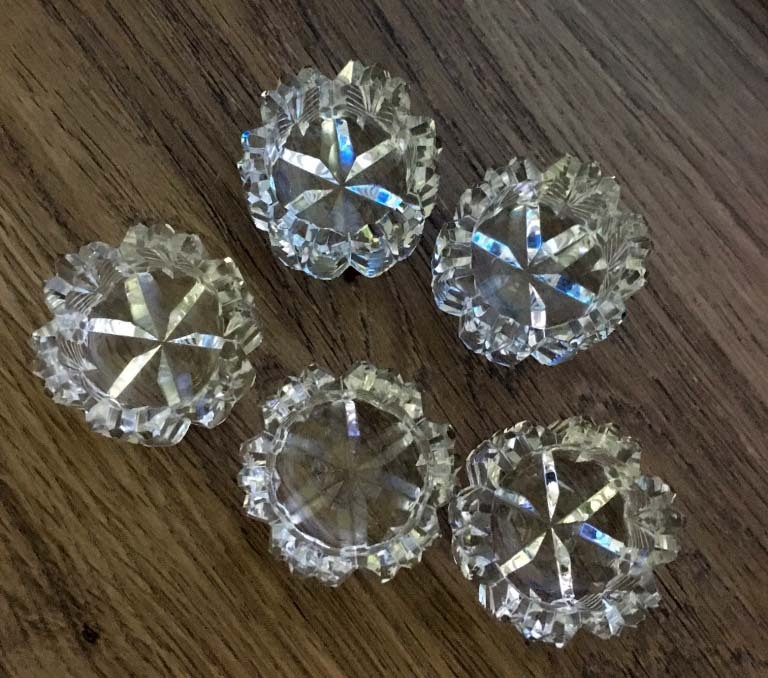 Now I need to polish them and look up the pattern name and date them. Lovely late Victorian silverplate pieces. 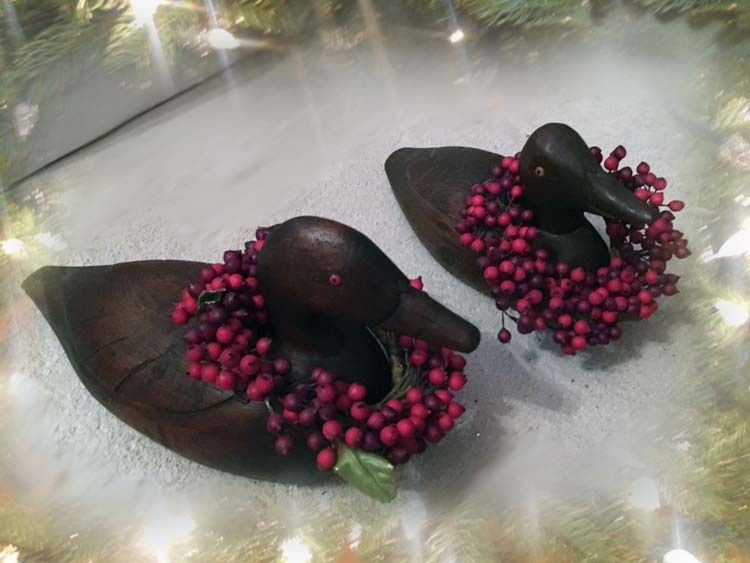 My most recent Lyon's Head Antique Mall sidewalk sale was this pair of hand carved duck decoys. Signed by the carver and dated 1909 and 1935. Wishing everyone a good final month of the year and blessings to you and those you love. I am one month away from my first year as a Florida resident. Still can't believe it will be a year as it seems like I'm still unpacking. My day job has me overwhelmed but living here makes it all worth it. Spent Halloween visiting my son and his family and I got to bring up costumes for them all as they went as a family dressed like Beauty and the Beast. I had such a marvelous time creating the costumes and so grateful that only hem adjustments were needed for the dresses as everything else fit like it should. The family that Disney's together has fun together. And the Enchantress who was the architect of all this fun. I traveled with all of these costumes in a checked back and I did not want to check an empty bag when I returned home so my lovely daughter in law took me junkin at her favorite thrift shop where I found some great treasure. Gorgeous vintage, cut crystal nappy. This one throws beautiful rainbows. 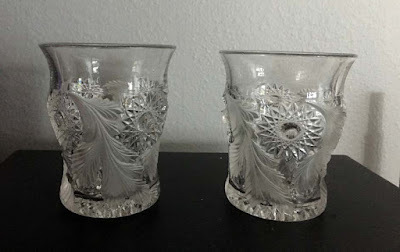 Stunning pair of Hobster and Feather tumblers by Millersburg glass. Circa 1909. 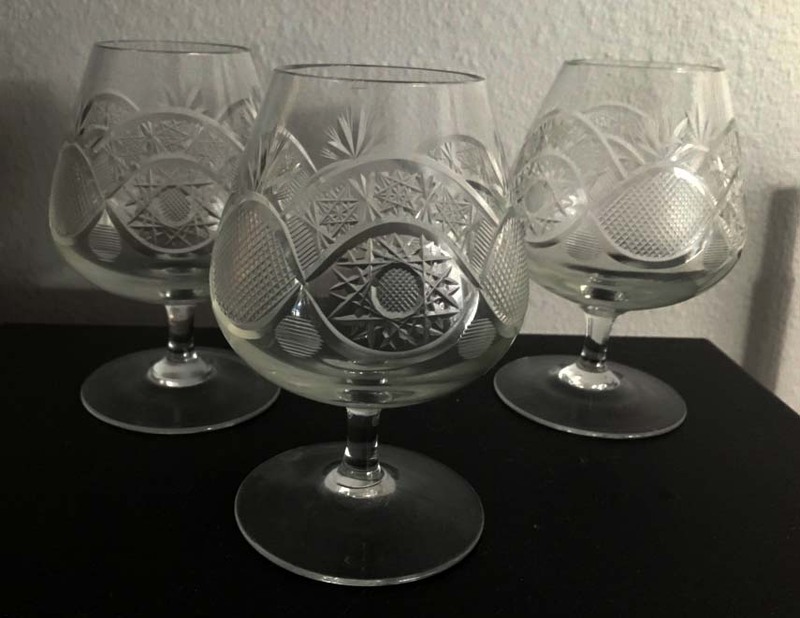 Lovely set of 5, cut crystal brandy snifters (two were still in the dish drain drying). Lovely quadruple plate urn and a group of vintage miniature billiard balls. 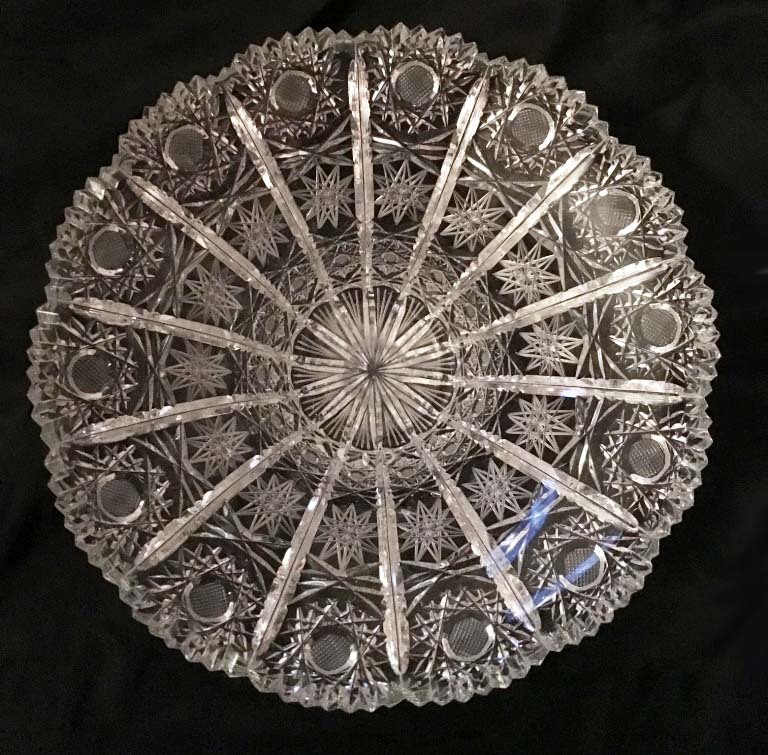 I'll be keeping the quad plate and adding it to my personal collection but the "balls" are going in my space this weekend. 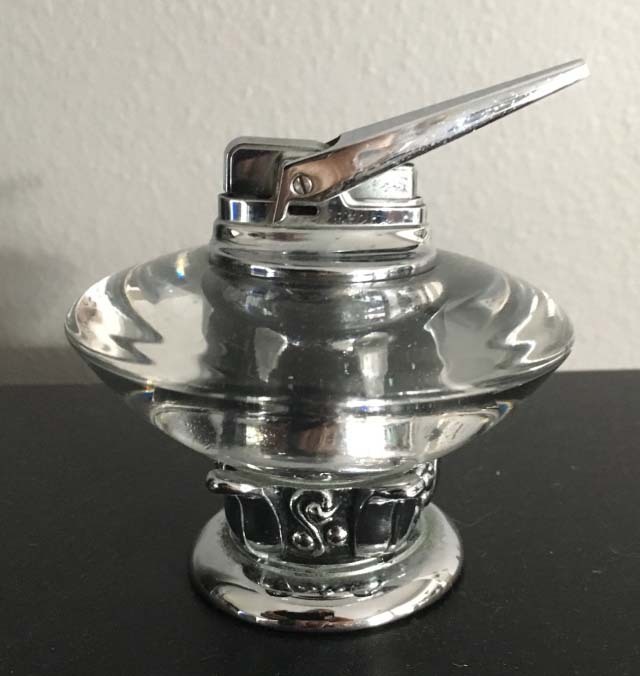 Fantastic and what looks like it was never used Ronson "Nordic" table lighter. Upon returning home, I still had two days of my day job to perform and then the weekend arrived and I was off to a few local haunts to see what was out there. 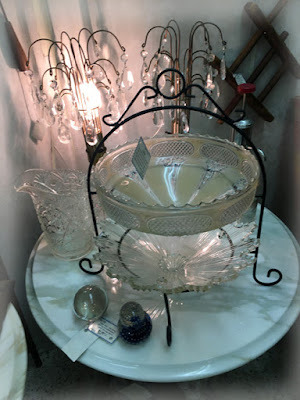 Sometimes the best place to shop is where you sell and these pretty cut crystal salts were at the front desk at the Lyon's Head Antique Mall. They always have "impulse items" for those checking out to see and I was drawn to these when I saw them. 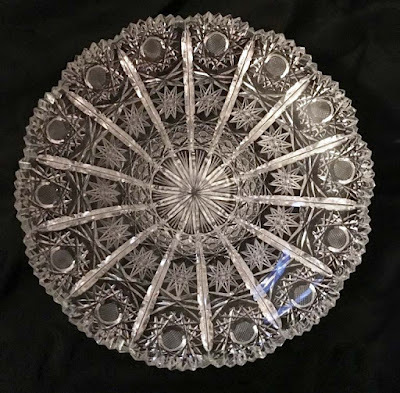 Marvelous marriage of two EAPG pieces. 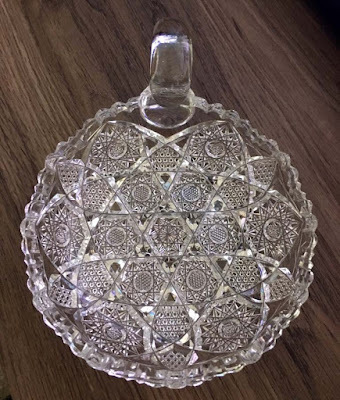 The top is a Gillinder, round frosted lion head and the bottom is ... well I haven't discovered this pattern yet so I'm still looking and will report back when I find it. Still, it was a great marriage of two pieces that did not start out together but ended up a perfect match. 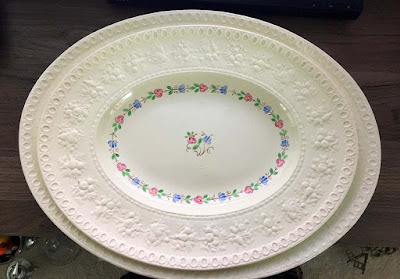 A Goodwill find, a pair of gorgeous Wedgwood serving platters. 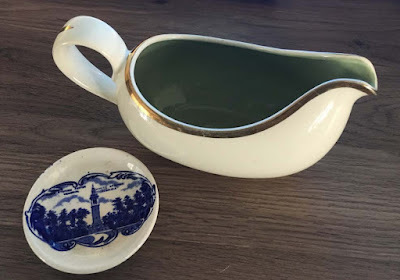 A nice, vintage gravy boat and pretty little butter pat. Finally, a terrific store display mannequin. Heavy duty and linen cover, am crazy mad for this. Especially since it was priced at $38.00. 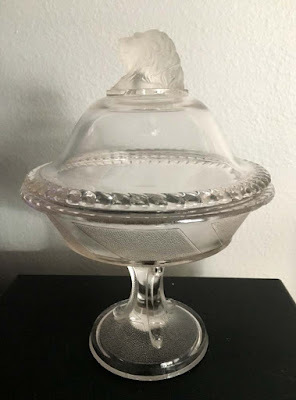 I use them in so many different displays and when sewing that I couldn't wait to wheel this sweetie out of the vehicle and into my home. Hello dear readers. I got caught up with too much work in September and the month got away from me but with October now here, there is no denying that even in North Florida, we have entered our own season of autumn. Shorter days, less humidity, and temps with lots of breezes make this a lovely time of the year. Of course, I'm knee deep in more tulle than a dance studio as I create Halloween costumes for my grandchildren. 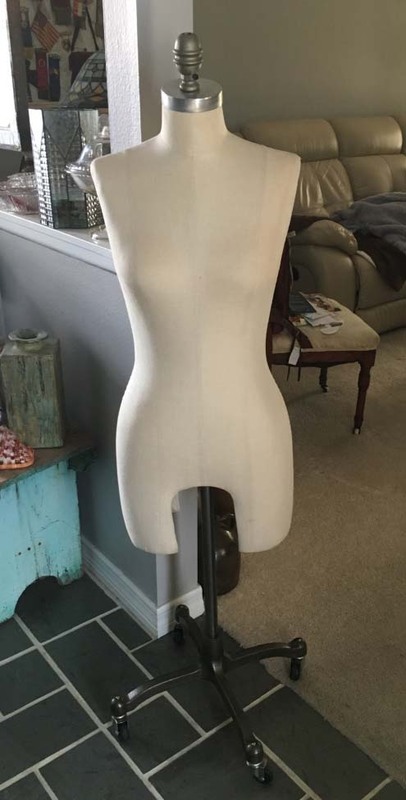 This year the family is going as Beauty and The Beast so I am making costumes for all of them. In between costume making I have been prepping my booth space for the upcoming seasons. 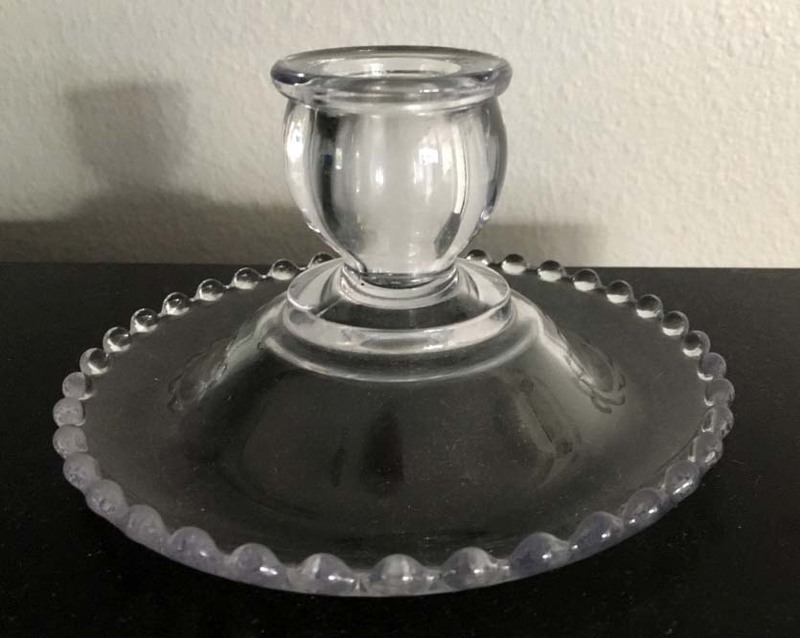 I'm slowly bringing out the pieces that everyone wants for their holiday entertaining and decorating. 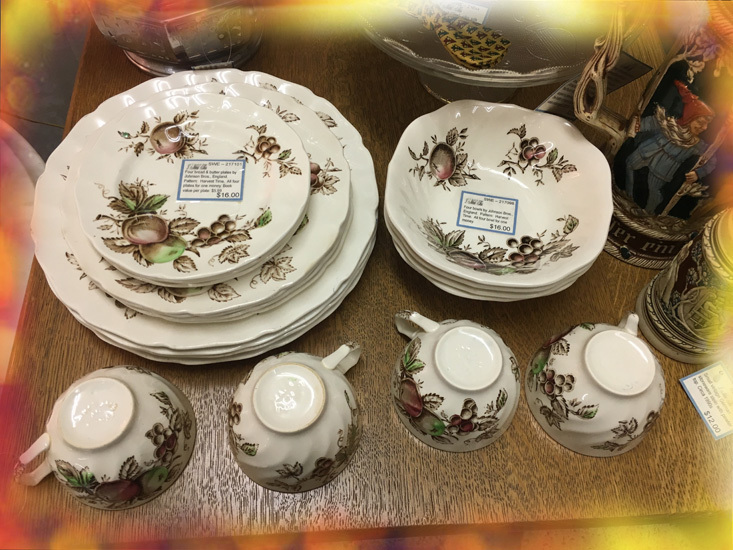 Dinner setting for four by Johnson Bros., England in their wildly popular pattern, Harvest Time. Vintage hats are always in demand this time of the year as well and this pretty brushed wool hat with velveteen fruit around it is too cha cha for words. 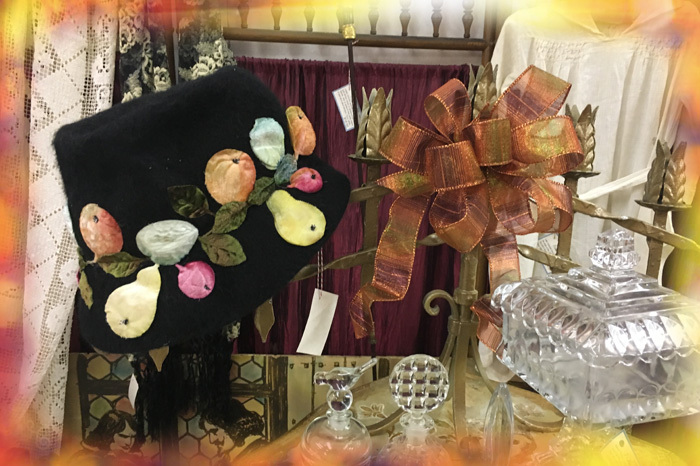 Another lovely vintage hat of smoked velvet and brilliant rooster feathers around the brim. I spent months searching for a small hutch as a display but couldn't find it anywhere. 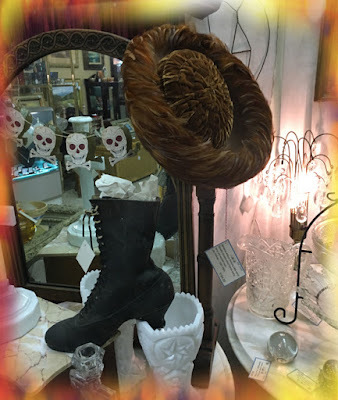 A fantastic architectural salvage store called Junk Co. opened a few doors down from the Lyon's Head Antique Mall where I have booth space and this faboosh piece was in the front windows. An antique store cabinet painted that sea foam green I just love. So much space and it was exactly what I needed as a display piece. 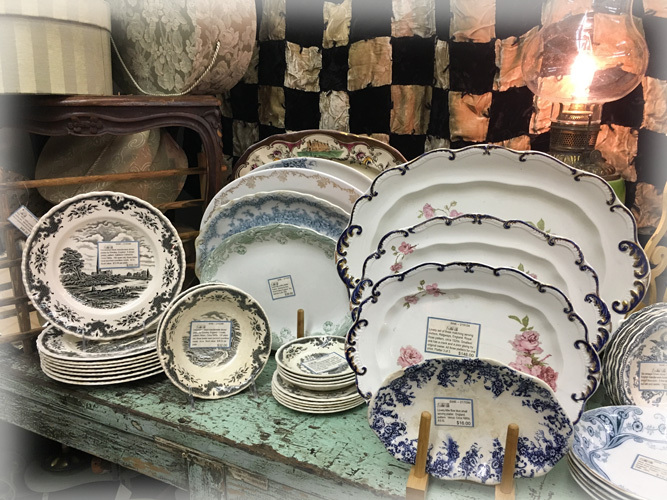 Large assortment of antique transferware platters abound along with dinner ware. Take a goodwill find server and add a pair of Art Deco pendant light shades and you have a one of a kind server for your holiday table. If this doesn't sell, I will not be sad because each time I look at it I kinda dig it even more. Did a little hunting at my favorite local haunts last weekend and came up with these treasures. 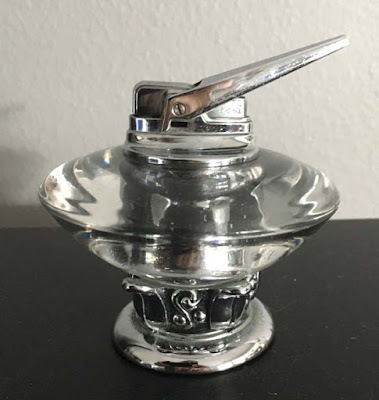 Stunning EAPG syrup with original lid. This is a keeper for my personal stash and I will use it over the holidays. I have a weakness for these vintage iridescent butterfly wing pieces from the 1950s. Usually brought back as souvenirs from Mexico, these are brilliant in their shades of blues. Lovely engraved Challah bread knife. 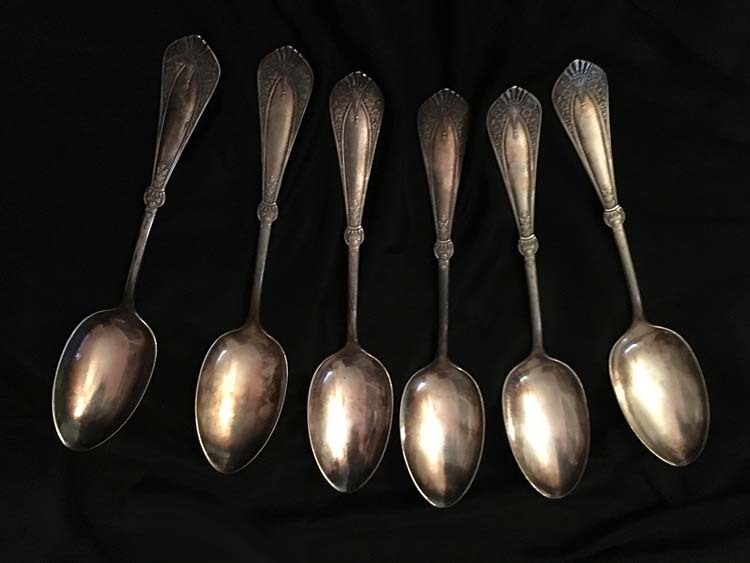 Lot of large antique and vintage serving spoons, a sauce ladle and teaspoons. A beautiful pair of silverplate candelabra inserts. 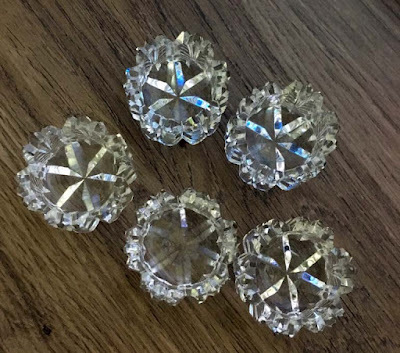 I use these in antique oil lamps and they look stunning. 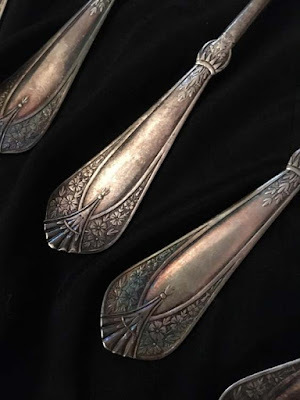 Not one, but two pairs of vintage silverplate candelabra inserts. An amazing find, stunning vintage mink coat by renowned furriers, "Coopchik Forrest of New York" and designed by Donald Brooks. Football great, Joe Namath wore Coopchik furs. Look at the handwork done in the lining. 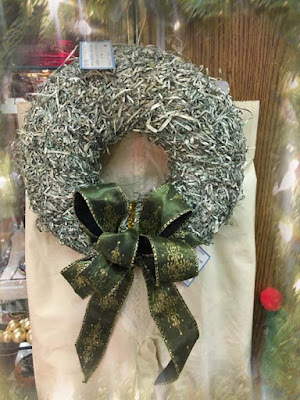 Both sides have this stunning stump work along with the traditional hand embroidered initials of the owner. and finally, place your bets ladies and gentlemen. 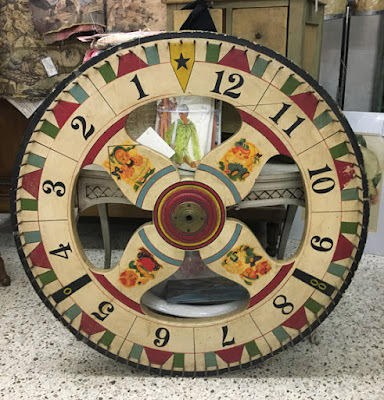 Round and round and round he goes, where she stops, nobody knows. A great piece of carnival history, this betting wheel or game of chance wheel is from the 1930s. 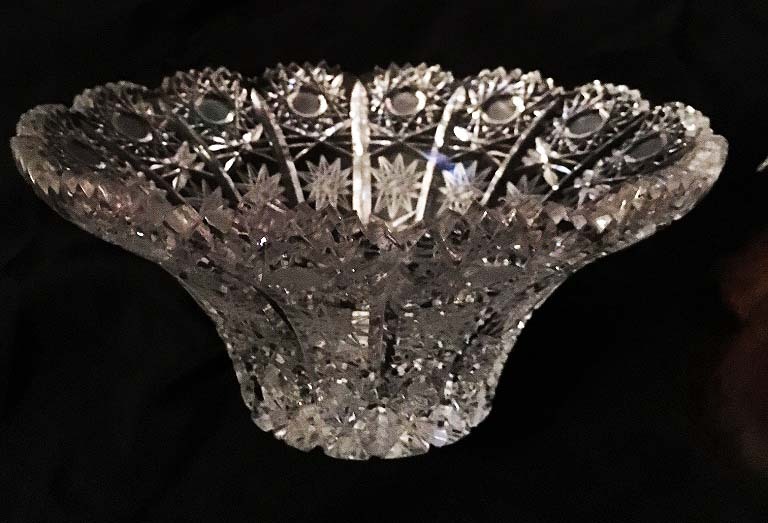 A truly unique decorative element over a mantle or on your wall space.